Is your beauty cabinet full of expensive makeup products that you never use? Instead of heading to the skincare aisle to solve your next beauty dilemma, take a trip to your local health store and pick up these one-ingredient natural beauty products. Your pocketbook and your skin will thank you! 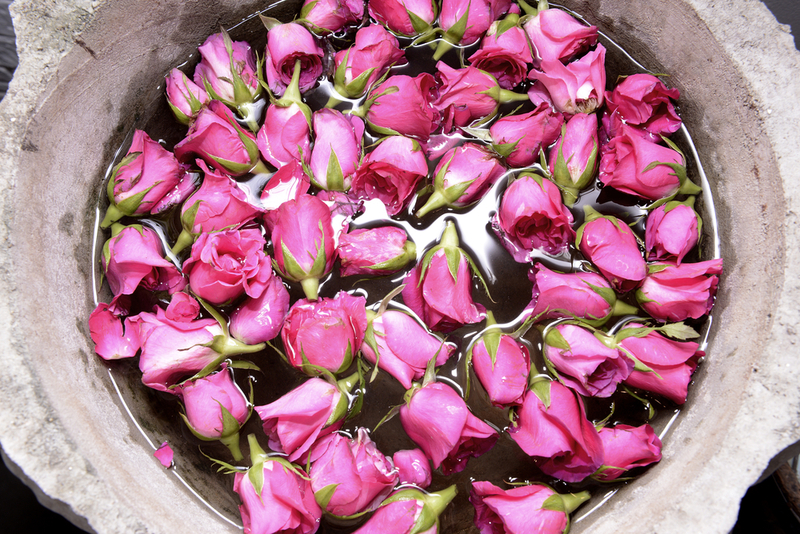 Rose Water – Makeup Remover: You can grab a bottle of rose water from your nearest health store or make your own by boiling fresh petals and rosewater with a teaspoon of Vodka for preservation. Rosewater’s natural cleansing properties make it an excellent makeup remover. Witch Hazel – Toner: Once you’ve removed your makeup and cleansed your face, grab another cotton ball and a few drops of Witch Hazel, a natural astringent that draws out impurities and tightens your pores. Tea Tree Oil – Blemish Remover: Tea tree oil has been used as a natural health remedy for centuries. With strong anti-fungal and healing properties, it’s great for treating an unsightly blemish that’s popped up overnight. Dilute it with a drop of water or oil (coconut or olive) before applying to your skin as it’s very potent. Eucalyptus Oil – Dandruff Remover: After a long workout add a few drops of eucalyptus oil to your conditioner to refresh your hair and to ward off conditions like dandruff or lice. Eucalyptus is a popular and very highly effective alternative to chemical treatments. Aloe Vera – Skin Soother: For everything from skin irritation to sunburns, this one ingredient wonder should be a staple in every bathroom. Aloe is naturally soothing and cooling which is the perfect remedy when you notice redness or minor irritation on any part of the body. It’s even gentle enough for your face! Wheat Germ Oil – Cuticle Moisturizer: If you paint your nails often, it’s imperative to take extra care of your cuticles. Rub a few drops of wheat germ oil on your cuticles every night before bed for a fast, effective moisturizing treatment. Wheat germ is high in natural moisturizing agents including vitamins B and E.
Baby Powder – Dry Shampoo: When you don’t have time to wash your hair or it feels oily, skip the wash and opt for baby powder. Pour a tablespoon in your hands or shake it (very carefully) onto your scalp. Massage it into your scalp and brush it out to refresh your locks and separate stringy strands. Lemon – Skin Lightener: If you have hyper-pigmentation or acne scars, lemon is a natural lightening agent. After you’ve juiced lemons, save the rinds and rub them on dark patches once a day in the shower. With consistent use, these areas will begin to lighten. Coconut Oil – Moisturizer: We couldn’t forget coconut oil, could we? For a non-greasy alternative to most lotions and oil moisturizers, use coconut oil. The trick is to use it right after your shower, but before drying off. Leave a jar or coconut oil next to the shower so it will slightly melt. After your shower lather on the melted coconut oil and then pat yourself dry with a towel. Your skin will glisten and feel moisturized, but not greasy. There you have it. These one-ingredient natural beauty products cover a plethora of beauty dilemmas so that you don’t feel forced to put damaging products (that are chock full of hard-to-read ingredients) on your face. Tragus piercing: Should you get one?